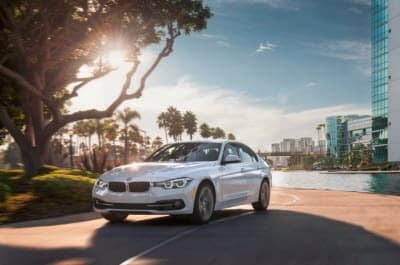 If you’re looking for a small sedan that’s powerful and fun to drive, as well as comfortable and luxurious inside, the BMW 3 Series is a great option for your daily commutes around Westchester County, White Plains, and New Rochelle. The car has tons of different options for you to choose from, so you can customize it to your exact preferences. To give you an in-depth look at these options and features, our team at BMW of Westchester has compiled this 2018 BMW 3 Series Review. 320i: Features a 2.0L 4-cylinder engine that makes 180 horsepower and gets an EPA-estimated 24 city/35 highway MPG. 330i: Comes with the same engine, but special tuning brings output up to 248 horsepower. Fuel efficiency is an EPA-estimated 23 city/34 highway MPG. 340i: Fitted with a 3.0L V6 engine that makes 320 horsepower and is EPA-estimated to achieve a fuel efficiency rating of 21 city/32 highway MPG. 328d: Comes with a diesel-powered 2.0L 4-cylinder turbodiesel engine that makes 180 horsepower. Fuel efficiency is 31 city/43 highway MPG. 330e: This plug-in hybrid model features both an electric motor, and a 2.0L 4-cylinder engine, making a combined 248 horsepower. This option gets a 71 MPG equivalent rating. 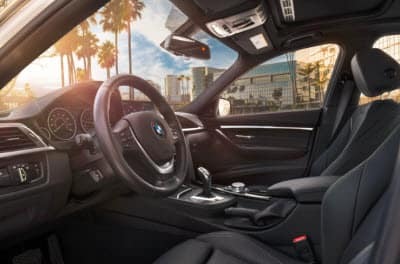 Inside the cabin of any 3 Series model, you’ll find seating for five on comfortably cushioned seats, and even the back seats offer plenty of space for adults. Leatherette upholstery and 6-way manually adjustable front seats are standard. Depending upon the trim or package you choose, seating upgrades include genuine leather upholstery, heated front and rear seats, and power adjustable front seats. In the back of the car, there’s 13 ft3 of cargo capacity. The 3 Series sedan comes standard with the BMW iDrive infotainment system with a 6.5-inch display screen. The system comes with Bluetooth® connectivity, a USB port to charge up your devices, HD Radio™ for clear sound quality, and a 9-speaker audio system. You’ll stay comfortable with the standard dual-zone automatic climate control, and you’ll get a rearview camera to make reversing safe and simple. If you want even more connectivity and convenience, you can add options such as satellite radio, Apple CarPlay™, a Wi-Fi Hotspot, a selection of driver assisting safety systems, and more. Thinking the BMW 3 Series sedan sounds like it could bring excitement and luxury to your drives around Westchester County, White Plains, and New Rochelle? It’s time for you to come see one in person! Contact BMW of Westchester to schedule a test drive, and you can get behind the wheel for yourself and see how much you love it. Or, fill out the form below and schedule your test drive online!